The Hoyo de Monterrey Epicure No.2 is a legendary creamy Robusto, 4.9” (143mm) long, of 50 ring gauge, and comes in aluminum tubes in a 15 cigars box. The Hoyo de Monterrey Epicure No. 2 is one of the best examples of a robusto and probably in the top five of all brands robustos. • Milder than the Cohibas, but it a cut above the Upmanns. 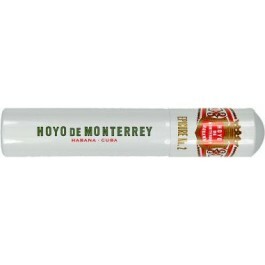 • A great Habano from Hoyo de Monterrey that should not be missing from the humidor of the true aficionado. It is creamy and smooth yet it is robust. The aromas of tobacco are strong but the tastes of cocoa, cinnamon and dried berries make it a complex cigar. The Epicure No 2 has a reddish brown wrapper much like cinnamon with a few very light veins. It is smooth to touch and a little oily. It is shiny in the light. It is nice and spongy. Strong aromas of earth are present on the foot. The pre-light draw is easy and smooth with a touch of cinnamon. The cigar has a nice easy draw from the very beginning that remains consistent all the way through, and produces clouds of smoke. The burn is even, where the burn gets slower and the flavor smokier. The ash reaches almost 2 inches in length. The Epicure No. 2 starts with a strong shot of tobacco combined with deep flavors of moist soil and lots of spices. After few puffs on the cigar, the cigar becomes smoother and the flavors settle.The spiciness is gone, being replaced by dried fruits and sweet floral flavors, still trailing the earthy profile of the cigar. The Epicure No 2 gets sweeter as you smoke though the second third, with flavors of leather, honey and cocoa, and a long creamy finish – definitely its sweet spot! The final third turns to a fuller body with the sweetness of caramelized sugar with hints of tobacco and leather in a creamy context. In summary, this cigar is full in abundance in a well-constructed, even-burning, good-drawing smoke. It has loads of smoke and plenty of taste.